Our youngest patients and their parents have no reason to worry when it comes to visiting us. Children three years of age and older should visit our office every six months so that we can care for their primary dentition (baby teeth) and help manage the transition to their permanent dentition (adult teeth). We place a strong emphasis on preventive treatment for children in an effort to avoid the need for more in depth treatment. Preventative treatments such as fluorides and sealants, in conjunction with good dental practices at home, ultimately help to preserve the condition of your child’s teeth, which will keep your dental costs to a minimum. When additional treatment is necessary, however, we will seek the most conservative but effective treatment for your child. During your child’s visit, both you and your child will receive special training in proper cleaning techniques and the use of fluoride toothpastes and rinses. 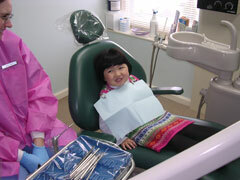 Your involvement sets a good example for your child, who may not yet understand the importance of good oral hygiene. Dr. Sophocles is a concerned parent, just like you, and he actively seeks ways to keep your child safe and comfortable. For example, our Panorex machine takes full-mouth X-rays in less time than a traditional bitewing series. Your child will only have to remain still for a few moments versus many minutes and will be exposed to less radiation. Please do not hesitate to call us at (610) 566-3326 if you have any questions about bringing your child to Providence Dental Associates.